Container gantry crane is a typical heavy duty gantry crane widely used in port and dock to load and unload containers from ships and move stack of containers at container terminals. This gantry container crane usually has high running speed and working level. 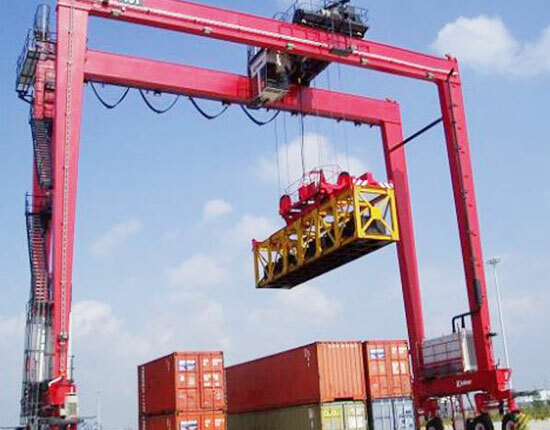 There are several different types of container cranes including rail mounted container gantry crane, commonly abbreviated to RMG crane, rubber tyred gantry crane, usually called RTG crane for short and ship to shore gantry crane. The type of gantry crane for container is highly dependant upon the vessels and environmental conditions. Ellsen is a professional container gantry crane manufacturer in China and can design the gantry lifting equipment with various specifications and dimensions on the basis of customer’s requirements. Contact us today to get the most suitable material handling solution for containers. 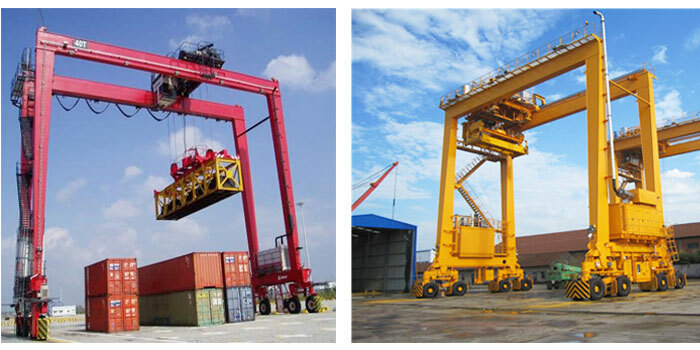 We mainly produce three kinds of container gantry cranes to suit different container handling needs. Before choosing a container gantry crane for your application, you should take a close look at these types of gantry cranes and their differences in order to make the best option. This RMG container crane is widely used in rail transfer yards and large storage yards to load, unload, transfer and stack a large quantity of containers. This type of gantry crane usually travels on a fixed rail path and mainly consists of main beam, rigid and flexible legs, running trolleys, lifting mechanism, crane running mechanism, electrical system and cab. The main beam can be outreached at one side or both sides to form a single cantilever or double cantilevers, or else you can choose a cantilever-free model. The use of cantilever structure is determined by the working site, the container lifting and transferring requirements. For instance, when you need to move containers through two legs, the rail mounted container crane with double cantilevers is the best option as it expands lifting space and has greater headroom. The RMG container crane without cantilever has relatively simple structure as it does not require containers to pass through the space between two legs. This RTG container crane is a mobile gantry crane widely applied in container terminals and depots. This container handling gantry crane can move loads from one freight yard to another easily and reach every corners of working areas. Due to the mobility, this mobile container gantry crane is powered by diesel generator sets. It is also equipped with anti-swing device to prevent the spreader swing during operation. In order to transport to other working sites, this equipment is also equipped with right-angle steering mechanism. The crane running mechanism is driven by two or four wheels according to your specific needs. Besides, in order to prevent collision between RTG container cranes or between the crane and container, manual deviation correction system an anti-collision device are set. This container port rubber tyred gantry crane is typically operated in the cab. Ship to shore gantry crane is widely used in port, quay and container terminals to load and unload containers from ships, usually abbreviated as STS gantry crane. This quayside container gantry crane is generally installed on the shores of port terminals and runs along two rails. This ship to shore container gantry crane comes into being to keep up with the development of large scale, panamax and post-panamax container ships. It requires highly for this dockside container gantry crane. On the one hand, it has to improve the container gantry crane specifications and dimensions including speed, outreach, lifting height and rated lifting weight. On the other hand, it has to develop and design a highly efficient container handling system to meet a larger production requirement for large ships. Served as a heavy duty crane, this gantry crane usually costs much more than other gantry cranes for common use. When buying a gantry crane, sometimes customers may be not sure which type will best fit their needs, so the first and most important thing is to understand the differences of these gantry crane types. And then you should clear your needs of container gantry crane capacity, span, lifting height and so on in order to determine the best container terminal gantry crane for your application. If you want to know the container gantry crane cost, tell us your specific requirements for a free quotation. Besides the above-mentioned gantry container cranes, we have some other types of container gantry cranes for sale. If you want to learn more about the types of container lifting systems, contact our sales manager and engineers online, and they will help you build an appropriate solution for your needs as well as offer you a preferential container gantry crane price. As a highly efficient container handling equipment, this gantry crane has significantly improved productivity. There is no sway in hoist trolley during the crane operation process due to the adoption of anti-swing device. It can achieve quick and accurate positioning. 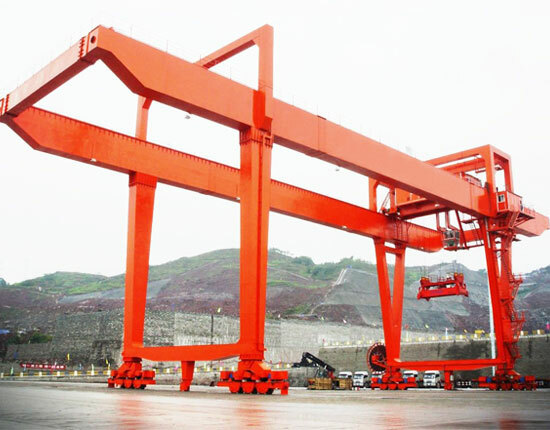 The container gantry crane requires minimal maintenance and rather low energy consumption. It is suitable for various workplaces, including port, dockside, quay and rail terminals. The container crane can make sure a highly safe operation and precise container handling. 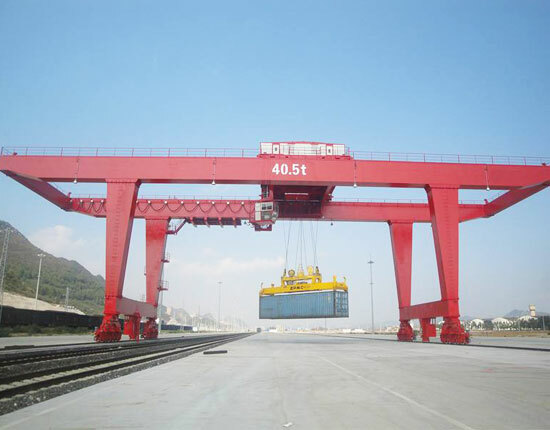 There are various options for container gantry crane design. For main components of gantry container crane, they are all purchased from reputable suppliers home and abroad so that we can ensure the crane quality and a long service life. For instance, you can choose electric hoist and motors either from our local manufacturers or from European suppliers. We also adopt modular design to maximize the adaptability and availability of the double girder lifting system. We supply container gantry crane options mainly including but not limited to: emergency drive and brake system, anti-collision and anti-swaying systems, remote operation system and positioning system. Our container gantry crane is tailored for each individual use of customers. You can select the specific gantry crane design that can best serve your needs. We are also willing to help you through the process of choosing the right container gantry crane. When looking for container gantry crane manufacturers, it is essential for you to choose an experienced and leading one, because it is not only highly related to your container gantry crane quality and price, but some follow-up services such as warranty, installation and maintenance services. If you are intended to buy a container gantry crane, we suggest you to choose Ellsen equipment, leading gantry crane manufacturer and supplier from China. We strictly inspect and control every aspect of production so as to ensure superior quality products. We also set a perfect service system including pre-sale, sales and after-sale services. In addition, we have an experienced technical team to do the design, research and development of gantry cranes and also provide technical support to customers. We constantly improve ourselves in quality and service and hope to create great value for clients. In short, you can buy our gantry cranes with confidence. To know more about different types of container gantry crane, please feel free to contact us online. Looking forward to working with you!